All the work needed to keep the garden open and beautiful–planning, planting, maintenance and administration–is done by people like you. as well as to dig, plant, weed and do other garden chores. You don’t need to be a member to volunteer; all you need is a few hours to contribute. 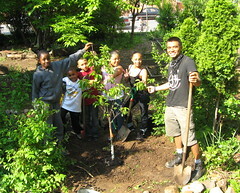 Volunteering is a great way to meet neighbors, get some exercise, and keep our neighborhood green. To find out how and when you can help, check the Brook Park Calendar (at right) for the next scheduled Volunteer Day, join our email list by filling out the EZ form to the right or talk with a member you see working in the garden. If you would like to contribute your skills in these or other areas, please fill out the convenient form below. If you can, please also consider making a financial contribution to support our efforts. Want to volunteer? Then please fill out the form at the bottom of this page. See below for Internship opportunities posted on our Idealist.org profile. Thanks again and we look forward to working with you!